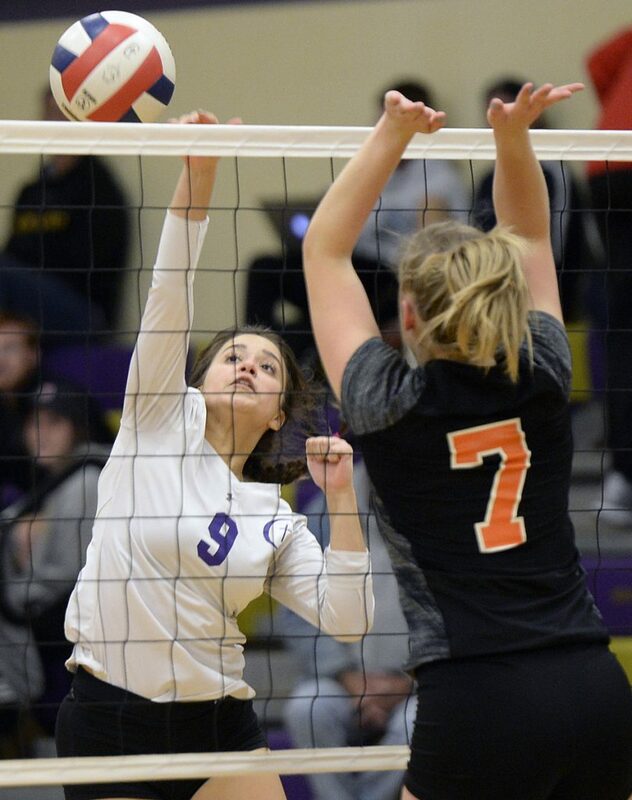 After winning two close sets to start the match, Cheverus’ seventh-seeded volleyball team wanted to make quick work of 10th-ranked Brunswick/Mt. Ararat in the third game of their Class A preliminary-round match Thursday night at Keegan Gymnasium. So Liza Rogers stepped to the service line and rattled off 10 straight points to help accomplish a couple of things. • Give the Stags their first-ever playoff victory. • Get herself home to take care of a more pressing matter. 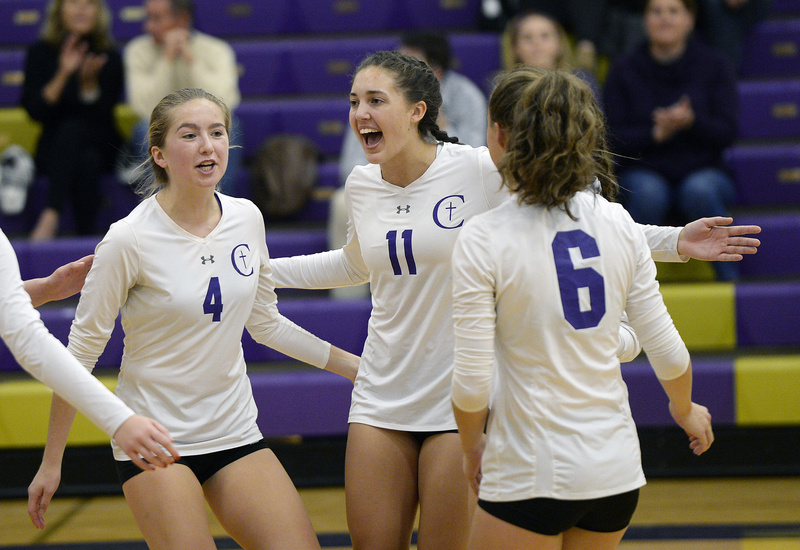 Cheverus had moments of celebration in its volleyball postseason victory Thursday night over Brunswick. Joining the fun, from left to right, are Mary Jerome, Emma White and Maddie Williams. Cheverus (9-6) will be at second-ranked Gorham (14-0) at 2 p.m. Saturday in the quarterfinals. The Stags had some nerves early and couldn’t shake Brunswick (4-11), a program in its third varsity season. But with the score 19-17, Cheverus got four straight points, capped by an ace from Madison Geiger, then closed out a 25-19 victory on a kill from Emma White. Brunswick’s Kassidy Dixon receives a serve from Cheverus. In the second game, Brunswick hung tough again, making it 10-10, then pulling within 15-14 on a kill from Kassidy Dixon. 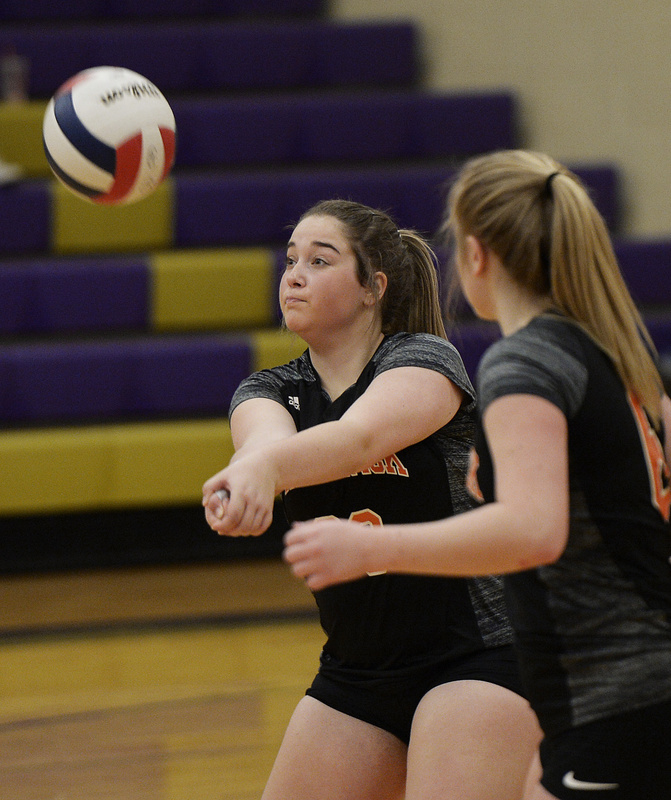 But with the set and momentum hanging in the balance, Cheverus got consecutive aces from Geiger, a kill from White, then another Geiger ace to close out a 25-16 win. Rogers started the third set with an ace. Nine points later she was still serving as the Stags took a 10-0 lead. “Liza has done some amazing things,” said Cheverus first-year coach Andy Wimmer. Emma White of Cheverus drives the ball back to Brunswick’s side. Brunswick got as close as 22-13, but a kill from White, a net violation and an ace from Abby Enck finished the third set, 25-13. 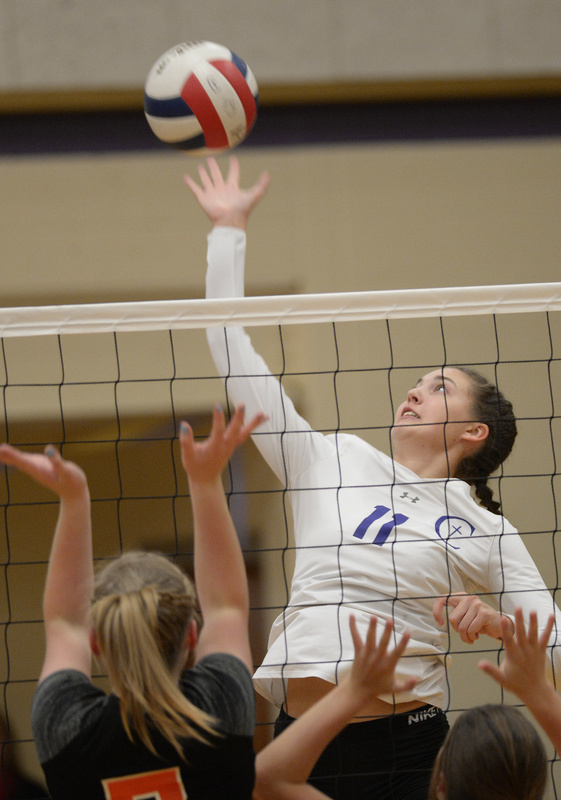 Rogers totaled 16 service points, Geiger had eight, Maddie Williams had 17 assists and Mary Jerome added six kills. Lauren Whitlock had nine assists for Brunswick. “I’m very happy with the effort,” said Brunswick Coach Kaili Phillips. “They had a strong server who picked us apart. We couldn’t get the ball back. THORNTON ACADEMY 3, SOUTH PORTLAND 1: Laura Fortier set a school record with 23 kills, Olivia Howe had 41 assists, and Johnna Scott added nine kills as the ninth-seeded Trojans (8-7) eliminated the eighth-ranked Red Riots (6-9) 25-5, 25-13, 24-26, 25-23 in a Class A preliminary at South Portland.